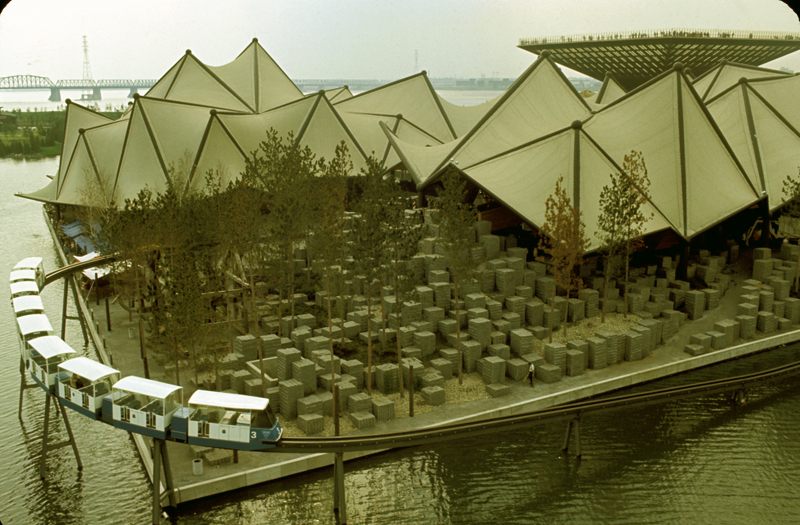 Expo 67, like the 1964 World’s Fair was a hot bed of film technology innovation. I already did one post on Charles and Ray Eames at the 1964 World’s Fair, now here is a story about Christopher Chapman. His film A Place to Stand was a big influence on many filmmakers including Norman Jewison director of The Thomas Crown Affair. Along with Haskell Wexler ASC (top right with me) and Pablo Ferro they created some memorable sequences. Art of the Title has great videos from this film. Pablo Ferro designed these five split screen sequences to highlight simultaneous actions and precise synchronization of a heist. Click here for more. Ontario is Canada’s most populous region, covering an area bigger than France and Great Britain combined, but when IMAX was introduced at Expo 67, Christopher Chapman fit the province into just 18 minutes. He made some 40 films for television, the National Film Board, movie theatres, tourism organizations, science centres and international expositions. But none proved as unforgettable or as influential as A Place to Stand, which he made without a script for the Ontario government to showcase the splendours of his native province. At Expo 67, in Montreal, it was projected in 70 mm on a screen measuring 20 metres by 9 metres, using nine synchronized projectors – the beginning of Imax technology. Every part of the giant screen was alive with moving images of the landmarks, industry, waterways, wildlife, culture and people of the province, seen through what appeared to be shifting windows of varying sizes against a black background. Mr. Chapman, who died in a long-term care facility in Uxbridge, Ont., on Oct. 24, called his technique multiple dynamic imaging. At Expo, where it was screened continuously, A Place to Stand was seen by two million viewers; after the fair, the film ran in the United States, Europe and in other Canadian cities, seen by 100 million people. Today it is being rediscovered by a new generation on YouTube. The film collected dozens of awards, including the 1968 Academy Award for best live-action short subject, and an Etrog, the equivalent Canadian prize. Fame never went to Mr. Chapman’s head; he said all he had wanted was to make people feel good. Visitors to his Uxbridge home in later years report seeing his Oscar statuette used as a doorstop. He points out that Mr. Chapman was not a true documentarian but a maker of “very successful promotional films” using nature, comparable to the uplifting mountain films of 1930s German director Leni Riefenstahl. Christopher Martin Chapman was born into a tumultuous household in Toronto on Jan. 24, 1927, along with his fraternal twin, Francis. Their mother, Doris Chapman, was a concert pianist and their father, Alfred Chapman, an architect who designed the city’s central public library at the corner of Beverley and College streets, now part of the University of Toronto. The twins were preceded by four elder siblings, Philippa, Howard, Robert and Sally. Another brother, named Julian, did not survive infancy. The twins wanted only to be together, but Francis was soon judged to have a brilliant intellect and put into a special class, then sent to the elite University of Toronto Schools; eventually he studied at the Sorbonne. Christopher’s giftedness was harder to classify and he ended up in a vocational stream that did not lead to university. He learned paper engineering, a craft that produces paper models used for advertising and pop-up books. Always interested in cars, he approached several automobile manufacturers when he was in his early 20s, with ideas for improving their products. He landed a job with the Ford Motor Co. in England, where he spent a year on headlight design. After returning to Toronto, he purchased a movie camera and taught himself to use it. His family owned land on Lake Simcoe and he moved to an unwinterized cabin there, getting his drinking water from the frozen lake, while filming the changes around him. The result was The Seasons (1954), a wordless short that won an award as film of the year and launched his true career. More films about the wilderness followed, including Quetico (1958) about the provincial park and Saguenay (1962) made for Alcan. For the National Film Board he made Magic Molecule (1964) and The Persistent Seed (1964) before submitting a proposal for a technically daring film to be seen at Expo, initially at the Bell pavilion. It was rejected. Mr. Chapman knew he wanted to use what are called travelling mattes. It was not a new technique – D.W. Griffith used it clumsily in his silent 1915 epic Birth of a Nation, and in France, Georges Méliès experimented with it – but no one had done it right. 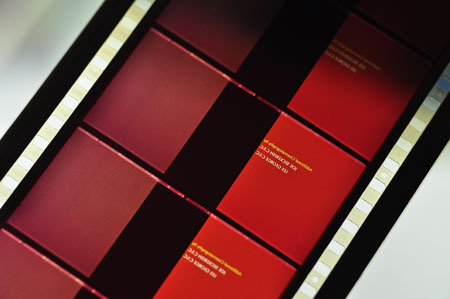 The technique involves short lengths of film simultaneously running behind mattes, within the openings created by animators through masking the unused portions of the frame. As many as six tracks of film may be combined into a single frame. Mr. Chapman criss-crossed the province with a 35 mm camera, shooting a total of 160,000 feet of film, from which he selected the most eloquent moments on two Moviola editing machines. (Some film was shot by David Mackay of TDF, the ad company the government had hired to stick-handle the project.) He then worked out the film’s story board. His sister-in-law Penny Grey, who later worked with him, recalls that he had a prodigious visual memory and could remember everything he had shot. 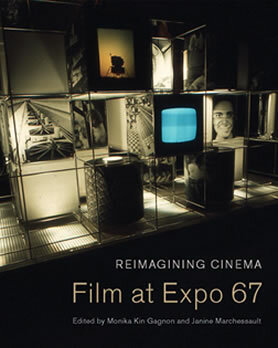 The film scholar Aimée Mitchell, who examined Mr. Chapman’s 350-page editing book, writes in a recently published study, Reimagining Cinema: Film at Expo 67 (edited by Monika Kin Gagnon and Janine Marchessault) that he “laid out on the gridded pages … the positions of numbered images, the timing of their appearance and disappearance from view, and their movement within and across the frame. Each page is accompanied by notes and instructions.” With his technical supervisor, Barry Gordon, he then took all the notes and pieces of film to the only place capable of doing the final assemblage: the Todd-AO studio in Hollywood. There word spread fast about the unorthodox Canadian filmmaker. One of the people who shook his hand and congratulated him after an early in-house screening was the actor Steve McQueen, who became a friend. If placed sequentially, the film clips in A Place to Stand would take 90 minutes to view, instead of 18 minutes. It is this condensation that gives the film its thrilling drive. Mr. Chapman’s dynamic technique was immediately borrowed by director Norman Jewison for The Thomas Crown Affair (1968), starring Mr. McQueen; it was used in the opening sequence of the 1970s sitcom The Brady Bunch; and it was used in The Boston Strangler (1968) and the disaster film Airport (1970). Today digital technology has made the effect much easier to accomplish. After his Oscar, Mr. Chapman refused many invitations to work in Hollywood, according to his wife, Glen Chapman: “He was a very Canadian boy – he wanted to stay in Canada,” she said in an interview. After much persuasion, he agreed to work with Broadway producer Gower Champion on a backdrop film for the musical Happy Times, but it was not a success. The show’s star, Robert Goulet, hated the film, which he felt upstaged him. Among his later works were the Imax films Volcano, shot in Iceland, and Toronto the Good, both made in 1973; Saskatchewan: Land Alive (1980); Kelly (1981) made for Famous Players and his only feature film; and several 3-D films, one shown at Science North in Sudbury, another at the science museum in Chicago, another at Parc Astérix, near Paris – all made with his brother Francis, who became a CBC producer. Francis was particularly adept at calculating the correct camera positions for 3-D filming. The brothers also collaborated on A Sense of Humus (1976) for the NFB, a prescient film about organic farming. In Mr. Chapman’s later years, until he began to develop dementia a dozen years ago, he took up still photography, producing dramatic large images of reflections on a lake. Mr. Chapman served as president of the Royal Canadian Academy of Arts and of the Directors Guild of Canada. He won many film awards and medals, received an honorary Doctor of Laws degree from Ryerson, and was appointed a member of the Order of Canada in 1987. His first wife, Aljean Pert, whom he married in 1962, died of heart disease nine years later, leaving him to raise their young son, Julian. A year later he was introduced to Barbara Glen Kennedy, 18 years his junior, who then worked in public relations. They married in 1974 and lived and worked together until his death. Mr. Chapman was predeceased by his elder siblings. Besides his wife, Glen, he leaves his twin brother, Francis; his son, Julian; and four grandchildren. Chapman’s A Place to Stand was his first widely-promoted attempt to realize his multi-dynamic image approach. 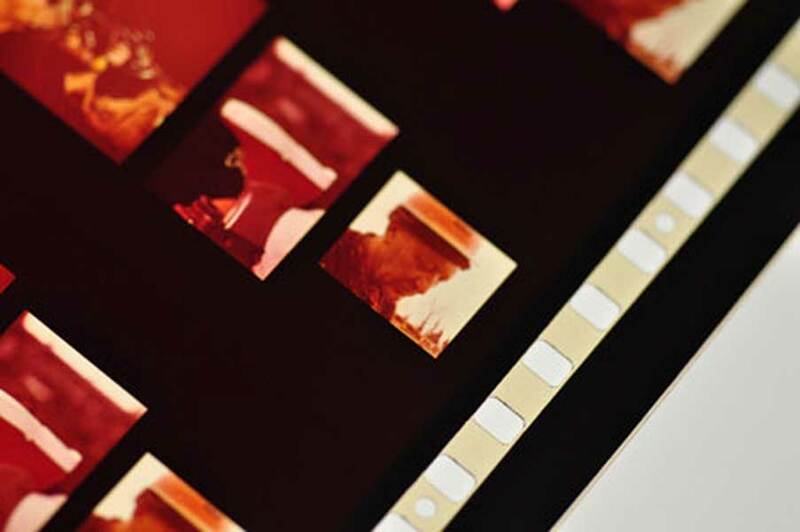 This is a fragment of the 70mmm film with sample images optically (photographically) printed as dynamic frames within the span of the 70mm frame. The film for the Ontario Government at Expo 67 is for me the culmination of a desire I had some years ago to try a moving multiple screen technique. I had never seen it done but I, myself, had experimented with panning a projector over a very large screen and was fascinated by the viewer’s relationship to a panning camera and a panning screen. In the conventional film for example, when viewing a pan across a landscape we watch the landscape move across a static screen. As soon as that screen moves with the pan we are watching a static landscape being revealed by a moving screen or “window”. While I did not explore this to any great extent in the Ontario film it was the basis for my direction of thought. It was this idea plus a dynamic screen technique (that I had heard of but not seen) that led me to explore the idea when I was originally making a presentation for the Telephone Association Pavilion at Expo 67. The dynamic screen consists of a matte covering the whole picture but allowing one part of the picture to be revealed through a “window”. This “window” would increase or decrease in size. A phone call to a lab in Hollywood warned me against the dynamic screen technique as it had been a failure in its latest adoption. My concern was whether it was a failure due to technical difficulties or creative misuse. Later while already well into the Ontario film we saw a print of “A Door in the Wall“, using the dynamic screen, and it was clear that its failure was creative not technical. When I was asked by David Mackay of TDF to produce and direct the Ontario film, there was no idea as to what the project involved. The only thing we knew was that we had to produce an unusual film in 18 months. My one desire then was to make a film that would give everyone as big boost and make them feel good, but it was not easy condensing Ontario – particularly a province that is so industrialized. There was no script. Time would have been required to develop a definite theme idea but time was extremely limited. Out of our discussion emerged the dynamic-multiple screen concept that I had long dreamed of. The key was a gigantic flat screen – a “mural” surface that one really could move upon and break up with multiple images. Barry Gordon, whom I had requested to be technical producer for the film, immediately set off for Hollywood to discover whether the required complicated processing could be done. Shooting on location was exploring completely new territory. An early mistake was making the shots I wanted to retain on the screen through a complete sequence of events, too short. The movement of the camera and the action within the frame had to be considered in a new way, which in documentary shooting is not always possible. I had to consider less interesting shots or deliberately make a shot less interesting. Such a shot might be an important element in a sequence but not the dominant one. A multiple of equally interesting shots might confuse the audience. Shots that I used to look at as normal academy frame proportions I now looked at with an eye to vertical frames and horizontal frames, odd frames, small frames and large frames. Since access to a 70 mm camera [sic] was impossible due to lack of time, another difficulty encountered was deciding, through consultation with Barry Gordon, whether a shot would retain its clarity when blown up to 70 mm. Blowing up 35 mm to such as screen as 66′ x 30′ which is the Pavilion screen, meant a very great stretch and not very many shots could stand it. This meant I would shoot a full screen landscape as 2 divided screens, which to me was unsatisfactory. Going to 3 or 4 composite screens was not the same problem as I used these as part of the design format. 180,000 feet of film were shot. Some additional footage of material I had not time to shoot myself was shot by David Mackay, using TDF cameramen. After completely familiarising myself with the footage, I worked out a storyboard of the entire film. Although it was theoretical, it did give me an impression of how the subject matter could be structured. I then had to devise my own charts as did Barry Gordon who translated my charts into his own lab charts in a language that the lab could comprehend. The lab was most impressed with the clarity of Barry Gordon’s technical instructions. To edit the film I had a 2 picture head moviola which was the closest one could get to visualising the results. One could only use it to compare actions of any 2 shots at one time and designate the length of shots. In normal film editing, one works with the actual footage and soon discovers that frame or two on any shot can make a difference in rhythm. With the Ontario film I could never “see” the film develop. The charts indicated the movement of the shots. Because of the shortage in time their could be no changes in structure in any of the sequences once they returned from the lab. It was a tremendous discipline for me, for once I had made a creative decision, I could not change my mind. The entire concept of development therefore, was on paper in chart form. Ken Heely-Ray of ADS (formerly of the NFB) laid the extremely complicated 6 tracks of film effects and music. It took 6 days to mix the 6 tracks at Todd-A-O in Hollywood. When all the sequences of the film were finally assembled after 4 months of optical work, there were 2 days to assemble them, see the completed film for the first time and return it to the lab for final processing. This gave the composer Dolores Claman 2 weeks to write the musical score which was arranged by Jerry Toth. The basis of the song “A Place to Stand” was suggested by David Mackay from a quotation of Archimedes, and the lyrics were written by Richard Morris. I am very grateful to the Commissioner of the Ontario Pavilion, J.W. Ramsay who, although he must have been anxious at many turning points, particularly since we were delving into such an unknown area of film, never once interfered in content, direction or completion. David Mackay of TDF also allowed me complete freedom, leaving all decisions to me. I feel that great deal of the film’s success is due to this trust. The film was conceived as a mural or painting would be. Its development was very personal, consequently it has the bad and the good of a single concept. My own connection with the film now is only through the audience. Perhaps some day I will view it unattached.